“The Little Flower of Jesus”… this title and blessed saint certainly touched my heart as a little girl before I even knew how to read her story. Since I only ever wanted to be a nun (even before I knew what it was) it was inevitable that this young, gentle-looking nun in my Fr. Lovasik Picture Book of Saints would attract me. Had I known how my life would unfold, perhaps I would have gone more for Leonie (or someone who at least seemed to struggle with their vocation) as a role model and patroness. But since Therese had managed to find me first, this “greatest saint of modern times” had gotten herself another devotee in the enamored heart of a little girl with big dreams. At first, Therese was my “secret patroness” because I knew pretty much everyone loved her and so I resolved to love her more than anyone but not let anyone else know (you see how this has changed drastically)! I wanted to follow her example as closely as I could. Two years passed, not nearly as well spent as hers no doubt, yet there was a small dream I had not yet attained before entering the cloister. Like Therese had, I wanted to make a pilgrimage to the “Eternal City”, and while there, I could not pass up the opportunity to see experience Lisieux, France! I would have no one but Therese as my guide for, while visiting the Churches and Holy places of Rome, Assisi, Paris and Lisieux, I devotedly carried with me Story of a Soul. Everything she had experienced I wanted to as well and since my heart was longing for Carmel throughout I felt that our hearts were indivisibly united by desire and empathy. Naturally, Lisieux was the highlight for me as I walked the grounds and re-lived the scenes of my heroine. I felt so close to her there and thought I was truly following in her footsteps, for everything she loved, I loved. (God only knows how far my soul was from being as pure and holy as hers). Somehow, I knew that she had helped me come to this place, desire Carmel and that now she would walk with me through those doors still. When that day finally came, it was evident that she had been with me for, though I had not chosen the date, I entered on January 2nd, (the Birthday of St. Therese and my deceased baby sister, Gemma Therese)! They held my hands as I was “born” into that new life. As you have all most likely experienced postulancy, I have no need to explain how you once again become a child in every way. This is when the spirituality of my patroness really came alive for me. To be a child… to be love in the Heart of Church… to be a hidden soul… to be a Victim of Merciful Love! Of course, with my ideals and youthful zeal (I entered only a month before my 18 birthday); this last devotion appealed to me most of all. I, too, wished to offer myself using the beautiful words that she did in her Act of Oblation (see Appendix from Story of a Soul). I gave myself to the life of Carmel and its sacrifices with much vigor, striving so hard to follow my sister Therese and become a saint myself. I believed I knew what a “perfect Carmelite” was and I constrained myself to follow this. My little Act of Oblation was accepted, though not in the way I imagined it should be and with much ignorance of the real sacrifice Our Lord would ask of me. I became ill shortly after making my First Profession. I thought, All right then. If Jesus is going to allow me to suffer then I will do it like Therese and hope that I too would be brought to Heaven speedily. Suffering was not as glorious or easy as I had imagined and though I waited for the final blow, it did not come in the way expected. As my mysterious illness progressed I became unable to live as the other sisters did (as a good Carmelite did) and with this I struggled. I read and re-read the analogy St. Therese made of the little bird who gazes at her Divine Sun and sees the great eagles (saints) soaring towards It, while she cannot fly. This little bird is not discouraged, but fixes her gaze on the Sun of Love and does not look away, even when dark clouds conceal It from view. 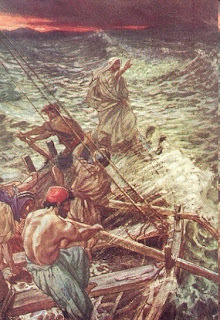 The eagles take pity and come to her defense against the demons who would prey upon her, for she is destined to be the prey One who will catch her up and carry her with Him to the “inaccessible light.” This gave me courage to believe that, even in helplessness, I could be Love in the Heart of the Church. The opportunity for the real oblation came when, to my great surprise, I was suddenly told that I was not meant to live this way and should return to my family to heal and discern God’s will for my life. I couldn’t believe it. This was my dream! Sure, I was struggling but wasn’t that just my cross? I complained to Our Lord, and He once again sent Therese to console and enlightens me. This time it was with her story of the Ball of the Child Jesus. This plaything allowed itself to be pierced and thrown in a corner by Him, deflated, yet it was at peace. I realized that I had to allow my grand ideals and plans for my life to be pierced through and deflated as well and only then would I find the true peace of being completely His! In my heart I prayed, “Lord, it is dark on this path, but I wish to close my eyes and place my hand in yours. Lead me and do with me what you like. I trust you.” I left Carmel with such peace and joy that it continues to amaze me when I reflect upon it. At last I knew the joy that Therese had experienced in her Act of Oblation, in her suffering, in her struggles. Her trust in the Loving Father from her child-like heart was so great that even being “pierced and cast aside” could not shake her. She knew that He still always loved her, that even when all seemed lost and she abandoned, He was only sleeping in her boat. She would not wake Him, but let Him sleep as the storm raged. My boat had started to drift in a different direction than I had wanted and Therese showed me that I could not steer it (no matter how much I wanted to be a certain way). She’s always been in the boat with me, I cannot explain it any other way and she has guided me lovingly to see my own littleness and allow the Father to be my Greatness! Instead of a role model, Therese has become a friend, a sister, a mother and I know she is not done teaching me. I pray that now I may say with her, “My one purpose then would be to accomplish the will of God, to sacrifice myself for Him in the way that would please Him.